CO2 tank Fill Adapter Connector Female Thread W21.8 DIN 477 with ON/OFF by GFSP Outdoor Sports at Baking Love. Hurry! Limited time offer. Offer valid only while supplies last. The CO2 Refilling Adapter is used to safely refill tank from larger donor tank. It is designed to allow refilling of W21.8 tank, or you can add an adapter to refilling of SodaStream or Paintball (CGA 320) tank. 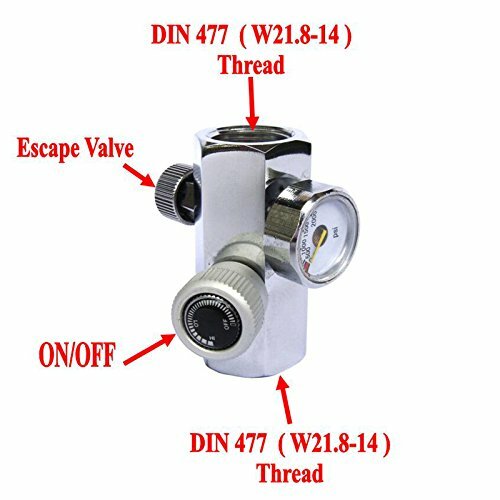 ON/OFF valve for safe and controlled release of gas.It has a Escape Valve to safely release the residual gas within the adapter once refilling is completed. With a pressure gauge to ensure the pressure will not exceed the pressure specification of the recipient tank. Innter thread: DIN477 / JIS m22-14 / BS 341 No. 8 / W21.8-14 / .860" x 1/14 (covers UK, Europe and Asia). If you have any questions about this product by GFSP Outdoor Sports, contact us by completing and submitting the form below. If you are looking for a specif part number, please include it with your message.